Have I mentioned that I love Mexican food? And combine that with a slow cooker? I think it’s a match made in heaven! Who’s having Ole’ Tonight? 1. Slow Cooker Enchilada Stack. So easy and cheesy! YUM! 2. This slow cooker Chicken Toritilla Soup looks amazing and the chicken is a great way to give it variety! 3. Mexican Lasagna is the perfect way to feed a crowd! 4. So my friend swears by quinoa, but I’ve never tried it myself! This Mexican Quinoa might be a good way to give it a go! 5. This shredded spicy beef is a the perfect game day food, right? Why not give these Beef Carnitas Tacos a try? 6. Now we’re combining pasta with mexican food? Oh wow this Enchilada Orzo is going on my list for sure! 7. Need to feed a crowd? 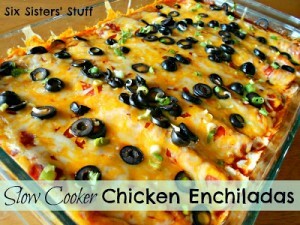 This Mexican Casserole should do the trick! 8. These Shredded Chicken Nachos can be an appetizer or the whole meal! Looks divine! 9. 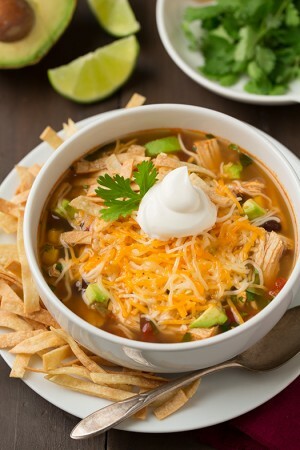 Perfect for a chilly day like today, this Mexican Chicken Chowder might be just the thing to warm you up! 10. Another great soup for a winter day would be the delicious Mexican Tomato, Rice and Veggie Soup! Maybe I should go plug in my slow cooker? 11. These refried beans would be perfect with some rice and you’re set! 12. A great way to eat your veggies, this Chicken Burrito bowl has an easy recipe in the slow cooker for that yummy chicken! 13. Wish I could be eating this one tonight! This Chipotle Steak Quesadilla looks out of this world! 14. Do you ever have a rice and beans month? This Rice and Beans recipe might be just the ticket till the next payday! 15. So 7 Layer Bean Dip is one of my favorite food groups out there! Ha! I’m thinking this slow cooker 7 Layer Bean Dip recipe might just be what I’ve been looking for! 16. Have cornbread lovers at your house? This Mexican Chili with cornbread topping has all the right stuff for a delicious meal to fill you up! 17. Another way to enjoy chili is with this chili cheese casserole. Copycat recipe of Taco Bell’s chili cheese burrito, only healthier! Looks yummy! 18. My husband likes his burritos smothered. Me, not so much. But I think I could handle it if I really had to! Did I mention I love mexican food? ha! Check out this Smothered Chile Colorado Burrito. Not many ingredients make this one a home run! 19. This Mexican hamburger casserole has just the right amount of crunch for a delicious meal! 20. The perfect taco meat requires only 3 ingredients in that slow cooker! Super easy! 21. Not just any cornbread, this Mexican Corn Bread has some yummy ingredients inside! 22. These Chicken Enchiladas are a ton easier to make if you get that chicken cooked inside a slow cooker with all those yummy ingredients! 23. A great recipe for those game day appetizers, these Jalapeño Popper Chicken Taquitos can’t be beat! 24. We just had tacos last night, but it didn’t look anything like this! Oh man this Chicken Carnitas Taco recipe can’t be beat! 25. Perfect for a busy night of activities, this Taco Chili will taste delicious and fill you up! I’ve decided I’m underutilizing that slow cooker in my kitchen. Headed to pull it out now! ‘Ole! I LOVE Mexican food and I love using my slow cooker, so this is right up my street! 🙂 Thanks for including my Mexican casserole! This collection is my dream come true. I could eat Mexican every night! My family likes Mexican food and I love cooking in my crockpot. Dinnertime win/win.